Museum offers tours by appointment; literature and video and historical displays of the 19th century related to slavery, Underground Railroad, Civil War and life post Civil War period. Our pilgrimage group visited here and it was a great orientation to Harriet Tubman as we started our journey. We learned a lot about an amazing woman. 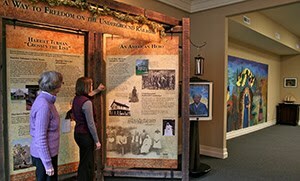 The Harriet Tubman Underground Railroad NHP has only been open for two years. The building was beautiful! There was a lot of information and we learned a lot about her courage and bravery.